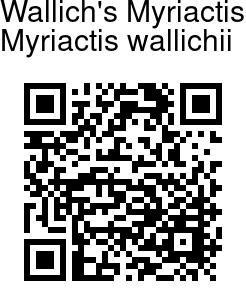 Wallich's Myriactis is an annual herb, 15-60 cm tall. Stems are erect, often many branched from base or middle, branches ascending, spreading, long, white bristly, sparsely hairy or hairless. Leaf-stalks are narrowly winged, base slightly expanded or eared, stem-clasping. Leaves are sparsely white bristly, sometimes smooth, base abruptly narrowed to rounded, margin toothed, wavy-toothed or entire. Mid-stem leaves are narrowly elliptic-lanceshaped or narrowly elliptic, 4-4.6 x 2-3 cm, uppermost similar or nearly linear. Flower-heads are hemispheric, about 1 cm in diameter (in fruit), numerous in lax clusters. Stalk is short and slender. 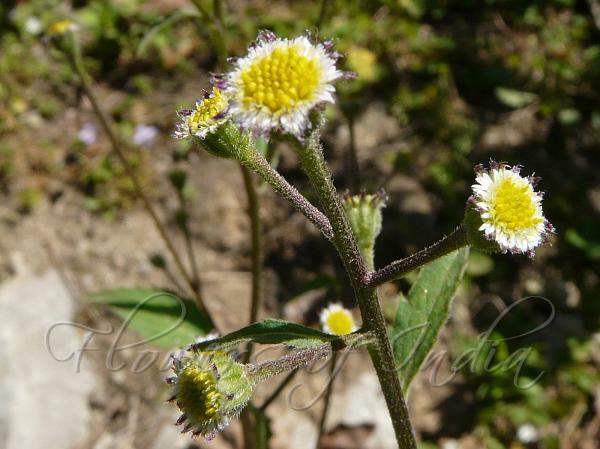 Phyllaries are in two layers, nearly equal, oblong or oblanceolate, 3-4 mm. Ray florets are arranged 2- or 3-layers, white becoming pink, linear. Disk florets are yellow to yellow-green, limb distinctly bell-shaped. Seed-pods are about 3.5 mm, shortly beaked. Wallich's Myriactis is found in grasslands, forests, on slopes in the Himalayas, from Afghanistan to Bhutan, at altitudes of 2600-3600 m. It is also found in China, Myanmar, Thailand, Vietnam, Caucasus, Iran. Flowering: August-October.